^ 1.0 1.1 1.2 1.3 Pirates of the Caribbean: At World's End (2007). Box Office Mojo. [2013-08-21]. （原始内容存档于2013-04-25）. ^ Revealing the True Nature of all the Characters. Production Notes. [2013-08-23]. （原始内容存档于2012-07-11）. ^ Kam Williams. Johnny Depp "The Pirates of the Caribbean" Interview. News Blaze. 2007-05-21 [2013-08-23]. （原始内容存档于2013-02-06）. ^ Brian Linder. Chow Down for Pirates 3. IGN. 2005-07-07 [2013-08-23]. （原始内容存档于2012-03-11）. ^ Depp & Bruckheimer Talk Pirates. IGN. [2013-08-23]. （原始内容存档于2012-07-14）. ^ 8.0 8.1 Trivia for Pirates of the CaribbeanDead Man's Chest. IMDb. [2013-08-23]. （原始内容存档于2012-01-20）. ^ Depp talks Pirates 2. JoBlo.com. [2010-11-10]. （原始内容存档于2010-05-24）. ^ Keith Richards 'tree fall' injury. BBC News Online. [2013-08-23]. （原始内容存档于2013-06-16）. ^ Keith Richards - Richards To Shoot Pirates Role In September. [2011-06-23]. （原始内容存档于2011-06-24）. ^ Full cast and crew for Pirates of the Caribbean: At World's End (2007). IMDb. [2013-08-23]. （原始内容存档于2011-09-28）. ^ Ian Berriman. Gore Verbinski on Pirates of the Caribbean 3. SFX magazine. 2007-11-13 [2013-08-22]. ^ Brian Linder. Back-to-Back Pirates. IGN. 2003-10-21 [2013-08-22]. （原始内容存档于2012-01-18）. ^ Pirate Lords. Walt Disney Pictures. 2007 [2007-07-01]. （原始内容存档于2007-07-02）. ^ Scott Holleran. Interview: Ted Elliott & Terry Rossio on 'At World's End'. Box Office Mojo. 2007-05-31 [2013-08-22]. （原始内容存档于2013-05-11）. ^ Chapter 7 - Return to The Bahamas. Production Notes. [2013-08-22]. （原始内容存档于2012-05-09）. ^ Singapore Sling. Production Notes. [2013-08-22]. （原始内容存档于2012-07-11）. ^ Captain Jack Sparrow Landed In Utah Last Week. KSL News. 2006-08-09 [2013-08-22]. （原始内容存档于2012-09-27）. ^ Jeff Otto. Pirates 3 Production Details. IGN. 2006-06-28 [2013-08-22]. （原始内容存档于2012-03-11）. ^ Noah Kadner. All Hands On Deck. American Cinematographer. June 2007 [2009-04-10]. （原始内容存档于2009-04-11）. ^ Josh Rottenburg. Days of Plunder. Entertainment Weekly. [2013-08-22]. （原始内容存档于2012-10-13）. ^ Sam Ashurst. Orlando and Keira: Uncut!. Total Film. 2007-05-14 [2008-06-09]. （原始内容存档于2008-06-09）. ^ Third Pirates filmed at Niagara Falls. ComingSoon.net. 2006-10-30 [2013-08-22]. （原始内容存档于2012-10-01）. ^ Bill Desowitz. ILM Meets the Maelstrom on the Third Pirates. VFXWorld. 2007-06-07 [2007-06-18]. （原始内容存档于2009-04-11）. ^ 26.0 26.1 Aloha Oe: Hawaii Farewell. Production Notes. [2013-08-22]. （原始内容存档于2013-04-26）. ^ Exclusive Interview: Terry Rossio. Moviehole.net. 2007-02-12 [2009-05-14]. （原始内容存档于2007-10-11）. ^ Exclusive Interview: Jerry Bruckheimer. Moviehole.net. 2007-05-21 [2009-05-14]. （原始内容存档于2008-06-23）. ^ The Pirate Maestro: The Music of Hans Zimmer. Buena Vista (DVD)使用|format=需要含有|url= (帮助). 2007. ^ Hoist the Colors. Buena Vista (DVD)使用|format=需要含有|url= (帮助). 2007. ^ The Disneyland Report. Disneyland announces sale of Pirates of the Caribbean: At World's End premiere tickets. DisneylandReport.com. 2007-04-13 [2013-08-23]. （原始内容存档于2013-03-21）. ^ Dave McNary. Disney moves up 'Pirates' opening. Variety. 2007-05-08 [2007-05-11]. （原始内容存档于2007-07-15）. ^ Ian Mohr. 'Spider-Man 3' sets records. Variety. 2007-05-01 [2007-05-02]. （原始内容存档于2012-11-06）. 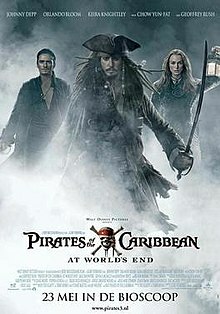 ^ Pirates Opens in Record # of Theaters. ComingSoon.net. 2007-05-24 [2013-08-23]. （原始内容存档于2012-10-01）. ^ Carl DiOrio. High expectations for 'Dark Knight' (Registration required). The Hollywood Reporter. 2008-07-16 [2013-08-23]. （原始内容存档于2012-10-23）. ^ The Dark Knight (2008). Box Office Mojo. [2013-08-23]. （原始内容存档于2013-05-02）. ^ DiOrio, Carl. 'Dark Knight' sells out quickly online. The Hollywood Reporter (Nielsen Company). 2008-07-17 [2013-08-23]. （原始内容存档于2008-08-03）. ^ Edward Douglas. Disney Kicks Off ShoWest Opening Ceremony. ComingSoon.net. 2007-03-13 [2009-04-11]. （原始内容存档于2009-04-12）. ^ Walt Disney Pictures. Pirates Trailer to Debut March 19!. ComingSoon.net. 2007-03-09 [2013-08-23]. （原始内容存档于2012-10-01）. ^ Nisha Gopalan. First Look! Toy Fair '07. Entertainment Weekly. 2007-02-09 [2013-08-23]. （原始内容存档于2012-10-13）. ^ Edward Douglas. Pirates of the Caribbean at Toy Fair '07!. ComingSoon.net. 2007-02-13 [2013-08-23]. （原始内容存档于2012-10-01）. ^ Disney Interactive Studios. Pirates to Set Sail on Consoles and Handhelds. ComingSoon.net. 2007-03-19 [2013-08-23]. （原始内容存档于2012-10-01）. ^ Soundtrack.Net : Pirates of the Caribbean: At World's End Soundtrack. Soundtrack.net. [2013-08-23]. （原始内容存档于2013-06-30）. ^ China gives bald pirate the chop. Associated Press. 2007-06-15 [2006-06-15]. （原始内容存档于2007-07-02）. ^ Walt Disney Pictures Home Entertainment. Pirates Hitting DVD and Blu-ray December 4. ComingSoon.net. 2007-07-26 [2013-08-23]. （原始内容存档于2012-10-01）. ^ Pirates Packaging Misprint. Blu-ray.com. [2013-08-23]. （原始内容存档于2012-02-25）. ^ Pirates of the Caribbean: At World's End. The-Numbers.com. [2013-08-23]. （原始内容存档于2013-05-08）. ^ Pirates of the Caribbean: Dead Man's Chest (2006). Rotten Tomatoes. [2013-08-23]. （原始内容存档于2013-05-30）. ^ Pirates of the Caribbean Dead Man's Chest Reviews. Metacritic. [2013-08-23]. （原始内容存档于2013-01-21）. ^ Pirates of the Caribbean: At World's End Movie Reviews, Pictures. Rotten Tomatoes. [2013-08-23]. （原始内容存档于2013-05-30）. ^ Pirates of the Caribbean: At World's End Reviews, Ratings, Credits. Metacritic. [2013-08-23]. （原始内容存档于2012-10-25）. ^ Alex Billington. Get Ready for a Swarm of Negative Critics This Friday on Pirates 3. FirstShowing.net. 2007-05-22 [2013-08-23]. （原始内容存档于2012-07-22）. ^ Drew McWeeny. Moriarty Sets Sail With PIRATES 3: AT WORLD’S END!. Ain't It Cool News. 2007-05-24 [2013-08-23]. （原始内容存档于2012-09-27）. ^ Todd Gilchrist. Pirates of the Caribbean: At World's End. IGN. 2007-05-24 [2013-08-23]. （原始内容存档于2012-03-11）. ^ Brian Lowry. Pirates of the Caribbean: At World's End. Variety. 2007-05-22 [2013-08-23]. （原始内容存档于2007-05-24）. ^ Pirates Of The Caribbean: At World's End. Total Film. [2009-05-14]. （原始内容存档于2007-05-24）. ^ Edward Douglas. Pirates of the Caribbean: At World's End. ComingSoon.net. 2007-05-24 [2013-08-23]. （原始内容存档于2012-10-01）. ^ Blake Wright. Pirates of the Caribbean: At World's End. ComingSoon.net. 2007-05-24 [2013-08-23]. （原始内容存档于2012-10-01）. ^ James Berardinelli. Pirates of the Caribbean: At World's End. Reelviews. 2007 [2013-08-23]. ^ Peter Travers. Pirates of the Caribbean: At World's End. Rolling Stone. 2007-05-22 [2009-05-01]. （原始内容存档于2009-05-01）. ^ Travers, Peter. Peter Travers' Best and Worst Movies of 2007. Rolling Stone. 2007-12-19 [2013-08-23]. ^ Review by Colm Andrew. IOM Today. [2013-08-23]. （原始内容存档于2013-08-23）. ^ Lam, Perry. Pirates of the Caribbean: At World's End. Muse Magazine. 2007年6月, (5): 73. ^ WORLDWIDE GROSSES. Box Office Mojo. [2013-08-23]. （原始内容存档于2013-07-26）. ^ 2007 WORLDWIDE GROSSES. Box Office Mojo. [2013-08-23]. （原始内容存档于2013-05-08）. ^ 66.0 66.1 66.2 66.3 Pirates of the Caribbean Movies at the Box Office. Box Office Mojo. [2013-08-23]. （原始内容存档于2013-04-25）. ^ 'Pirates' Vs. 'Pirates'. Box Office Mojo. Amazon.com. [2013-08-23]. （原始内容存档于2013-04-25）. ^ WORLDWIDE OPENINGS. Box Office Mojo. Amazon.com. [2013-08-23]. （原始内容存档于2013-08-01）. ^ Gray, Brandon. Third 'Pirates' Sacks Memorial Record. Box Office Mojo. Amazon.com. 2007-05-29 [2013-08-23]. （原始内容存档于2013-05-09）. ^ Gray, Brandon. 'Harry Potter' Already Breaking Records. Box Office Mojo. Amazon.com. 2011-07-13 [2013-08-23]. （原始内容存档于2013-05-14）. ^ All Time Memorial Day Holiday Weekends. Box Office Mojo. [2013-08-23]. （原始内容存档于2013-06-18）. ^ Third 'Pirates' Sacks Memorial Record. Box Office Mojo. Amazon.com. [2013-08-23]. （原始内容存档于2013-05-09）. ^ 2007 DOMESTIC GROSSES. Box Office Mojo. Amazon.com. [2013-08-23]. （原始内容存档于2013-05-08）. ^ 2007 OPENING GROSSES. Box Office Mojo. Amazon.com. [2011-09-05]. （原始内容存档于2011-06-23）. ^ Monthly Box Office. Box Office Mojo. Amazon.com. [2013-08-23]. （原始内容存档于2013-05-13）. ^ Gray, Brandon. Third 'Pirates' Sacks Memorial Record. Box Office Mojo (Amazon.com). 2007-05-29 [2013-08-23]. （原始内容存档于2013-05-09）. ^ WORLDWIDE GROSSES. Box Office Mojo (Amazon.com). [2013-08-23]. ^ OVERSEAS TOTAL ALL TIME OPENINGS. Box Office Mojo. Amazon.com. [2013-08-23]. （原始内容存档于2013-05-08）. ^ Subers, Ray. Around-the-World Roundup: 'Transformers' Lays Waste to World. Box Office Mojo (Amazon.com). 2011-07-05 [2013-08-23]. （原始内容存档于2013-05-13）. ^ Bresnan, Conor. Around the World Roundup: 'Sweeney Todd,' Russian Movie Lead. Box Office Mojo (Amazon.com). 2008-02-02 [2013-08-23]. （原始内容存档于2013-05-09）. ^ Bresnan, Conor. Around the World Roundup: 'At World's End' Massive in Beginning. Box Office Mojo (Amazon.com). 2007-05-30 [2013-08-23]. （原始内容存档于2013-05-10）. ^ Subers, Ray. Around-the-World Roundup: 'Taken 2' Crushes Predecessor, 'Ted' Sets New Record. Box Office Mojo (Amazon.com). 2012-10-16 [2013-08-23]. （原始内容存档于2013-05-29）. ^ Overseas Total Box Office Index for 2007. Box Office Mojo. Amazon.com. [2013-08-23]. （原始内容存档于2012-10-23）. ^ Dave McNary. 'Pirates' tops $500 million overseas. Variety. 2007-06-13 [2013-08-23]. （原始内容存档于2007-06-16）. ^ Blair, Gavin. 'Alice' gets to 10 bil yen faster than 'Avatar'. The Hollywood Reporter. 2010-05-24 [2013-08-23]. （原始内容存档于2012-10-26）. ^ Pirates of the Caribbean: At World's End (2007) - International Box Office Results. Box Office Mojo. Amazon.com. [2013-08-23]. （原始内容存档于2013-05-15）. ^ The 80th Academy Awards (2008) Nominees and Winners. Academy Awards. [2013-08-22]. （原始内容存档于2012-09-29）. ^ Art Directors Guild- Official website – 12th Annual Excellence in Production Design Awards. Art Directors Guild. [2013-08-22]. （原始内容存档于2012-07-22）. ^ ASCAP – ASCAP Composers Golden at the GoldSpirit Awards and Úbeda Film Music Conference. ASCAP. [2013-08-22]. （原始内容存档于2012-10-09）. ^ BAFTA Film Nominations 2007. BAFTA. [2011-06-18]. （原始内容存档于2011-11-18）. ^ McCarthy, Libby. Costume Designers unveil nominees. Variety. 2008-01-26 [2012-11-08]. （原始内容存档于2012-11-08）. ^ 2008 MTV Movie Awards. MTV. [2013-08-23]. （原始内容存档于2013-08-12）. ^ The People's Choice Awards Winners!. ComingSoon.net. 2008-01-09 [2013-08-23]. （原始内容存档于2012-10-01）. ^ HelloMovies – Pirates of the Caribbean award list. Hellomovies.com. [2011-06-19]. （原始内容存档于2009-06-21）.